Jane Testerman of Hollis is being recognized as a significant woman in Oklahoma agriculture. She helps her husband Charlie full time with his three businesses – Testerman Farms, Circle T Trucking, and Testerman and Son Harvesting. HOLLIS – It only took 21 years for Jane Testerman to land her dream job. She only wishes it could have happened sooner. Testerman, who now helps her husband Charlie full time with his three businesses – Testerman Farms, Circle T Trucking, and Testerman and Son Harvesting – says her lengthy career in teaching was only holding her back. While she spent her days impacting children at school, she was running herself in circles between keeping farm records and working at school. Testerman was anxious to be outside if it was a nice day. She loved being outdoors. Testerman’s husband is a fourth-generation custom harvester of wheat and corn. With a partnership between him and his father Doug, Testerman Farms consists of about 2,000 acres of cotton and 3,000 acres of wheat. Additionally, the Testermans have a small herd of cattle and the trucking business, where they haul grain, fertilizer and cotton modules. Testerman recalls the challenges she faced trying to juggle teaching and agriculture. With her husband often gone on harvest, she kept things afloat back home, managing paperwork and directing trucks. The record keeping kept her busy. “Plus then we had our livestock in the barn, our show stock,” she said. The Testermans’ three daughters, Blair, 25, Mylah, 20, and Hadie, 14, who are “quite the characters,” all exhibited sheep and pigs, but cattle was their main focus. “When we got a little more involved in the stock shows, I had to take off work to go, and so that was hard for me,” Testerman said. The Testerman daughters have been farming since they were babies, literally. Testerman says the reason she loves agriculture is because of the next generation. Since the girls have traveled and have grown up around the hired help, they have learned valuable life skills. Testerman is convinced agriculture was the best place for her children. All the girls can run the equipment – combines, tractors and grain carts. “I mean it’s definitely a family business,” Testerman said. The girls often get frustrated with boyfriends who do not understand farming. She knows without a doubt her kids know how to work because of their experiences with agriculture. It has exposed her children to outstanding people as well. “Agriculture – whether it’s farming, harvesting or livestock showing – all of that puts the kids around good people that are hardworking,” she said. Her kids understand the need to pray for rain – to keep livestock alive. On top of keeping records and directing trucks, Testerman now keeps all computer software up-to-date for accounting purposes for all three businesses. As technology has advanced, she now enters the amount of fertilizer and water used by each sprayer into a computer system. She picks up parts and runs the hired hands around – who say they would rather have Charlie in charge because Jane works them too hard. “Since I quit teaching, my role has quadrupled,” Testerman said, who describes herself as farm hand and secretary. She is busier now than she was when she was teaching. “I learned early on that learning all of those things was not necessarily a good thing,” Testerman laughed, because the more she learned, the more she was put to work. Because the Testermans have “lots of different irons in the fire,” they have had to cut back. Currently, the Testermans still custom harvest 10,000 to 12,000 acres, all within a 60-mile radius of home and the Texas Panhandle. This past year, the crops overlapped. Testerman’s earliest memories of agriculture come from two places: her dad and 4-H. Her dad, Larry Odom, was the district conservationist for the Harmon County Natural Resources Conservation Service from 1972 to 2008. She exhibited sheep through 4-H, which is where she first fell in love with agriculture. Now her kids have shown livestock for 16 years, and by the time her youngest graduates, she will have attended 20 Oklahoma Youth Expos. 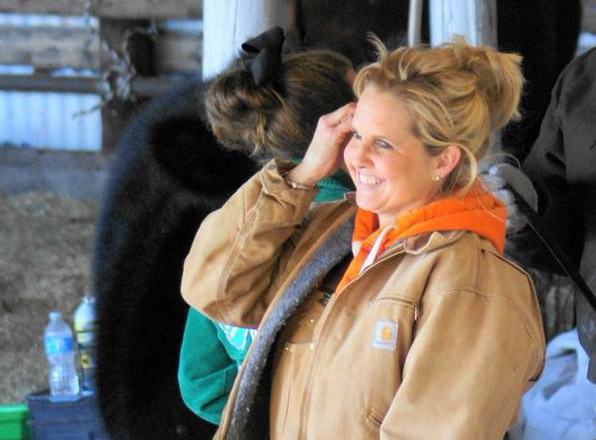 Some of her fondest memories include her daughters’ stock show success. Blair had two breed champions with her steers. FFA and 4-H are very important to the Testermans, who are currently working with the superintendent to build a multi-purpose facility. Martin Lewis, Doug’s first cousin, passed away this past year and left money to be donated to a good cause, which involved youth and/or animals. The Testermans chose to use that money for the facility, and this enabled the school to start building. She also organizes the Keaton Owens Memorial Scholarship in honor of her nephew. She gathers funds each year, which are then awarded to FFA and 4-H students to help fund next year’s show project. “Agriculture has kind of consumed our household and everything that we do,” she said. Like all farmers, the Testermans face challenges every day, from drought and erosion to the rising costs of equipment and chemicals.